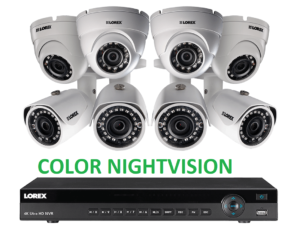 Experience a heightened level of clarity and detail in your surveillance monitoring with this complete 1080p HD surveillance system from Lorex. The MPX422D features our first-class DV700 HD DVR paired with two LBV2711B bullet and two LEV2712B dome 1080p weatherproof security cameras. Perfect for your home or business, the MPX422D is a professional-grade surveillance system that provides you with industry-leading HD resolution and outstanding night vision to help you secure what matters most. 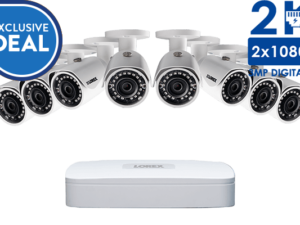 There’s room to grow with Lorex’s web exclusive MPX42 security system. Enjoy a heightened level of clarity and detail thanks to crystal clear high definition video, and rest assured that your home security system can support two additional cameras if your monitoring needs ever change. The MPX42 features a first-class 4-channel DV700 HD DVR and two top-of-the-line HD 1080p weatherproof security cameras. The MPX42 produces stunning high definition security video. 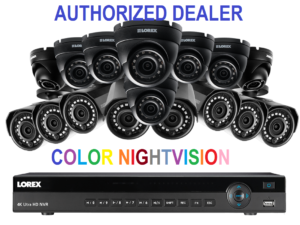 A security system with HD picture quality leaves nothing to the imagination, and could end up being the difference in whether you can identifying faces or license plate numbers should an intrusion ever occur. Enjoy extremely smooth on-screen movement with 30 frames-per-second (in 720p mode) video so that you never miss moment. An included HDMI cable easily connects your MPX42’s DVR to an HDTV or monitor so that you can watch your live security feeds or review footage. MPX systems include a Digital Video Recorder (DVR) and HD analog security cameras. This type of technology uses RG59 siamese BNC cables. MPX systems feature HD recording, remote viewing, and motion notifications. Siamese BNC cabling is used in the MPX42 to deliver stunning 1080p HD video. This type of cabling provides both video and power transmission for an easy-to-install process that will have your security system up and running in no time. The 4-channel DVR is also backwards-compatible, which means that you can use older compatible BNC cameras to expand your security coverage. View every camera in your security system with FLIR Cloud™, our innovative cloud solution. When you connect your DVR to FLIR Cloud™ you create a secure link to your MPX42 security system that can be accessed through your smartphone, tablet or computer. With FLIR Cloud™ you can even set your DVR to send motion-triggered push notifications, and email alerts with screenshot attachments. Our FLIR Cloud security camera app makes monitoring your Lorex by FLIR security system easy. Available for iOS, Android, Mac and PC, FLIR Cloud lets you view your entire security system from anywhere in the world. Monitor your property in real time and watch recorded footage from wherever you are. Cutting edge infrared (IR) LEDs enable excellent security camera coverage throughout the night. With LBV2711B security cameras you can see clearly at night – up to 150ft / 46m in ambient lighting and 100ft / 31m in total darkness. SmartIR technology aids with close up recognition of objects, and ClearNight imaging provides superior low light operation (and recording efficiency). 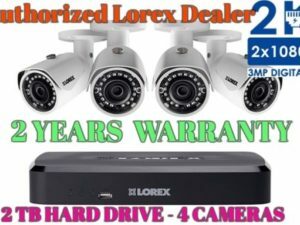 With all of this on your side, be confident your Lorex security cameras will watch over things even when you cannot. When it comes to outdoor installation options, Lorex’s web exclusive LBV2711B HD security camera proves to be exceptionally strong and flexible. Versatile ceiling or wall mounting options enable placement where you need it most – indoors and outdoors. With an IP66 rating, LBV2711B security cameras can endure heavy rainfalls and extreme temperatures as low as -22°F (-30°C). Their lightweight and durable polycarbonate housing makes them an easy choice for protecting what matters most. The MPX42 employs a security grade hard drive to take on the task of storing security footage. Not your run-of-the-mill HDD, this hard drive is manufactured specifically for the high workload demands of security monitoring. Record weeks (or even months) of footage with its 1 terabyte storage capacity. Save disk space by easily adjusting DVR settings that let you record at lower resolution. You can also program scheduled recording times, or set the DVR to record only when one of your security cameras detects motion. The calculation above is based on recording at 1080p @15FPS. Recording times will vary based on 2K or 4K resolution recording. Visit our Hard Drive Calculator to estimate your desired specifications. Security DVRs connect to BNC cameras using RG59 coaxial cables and they compress and store video footage captured from security cameras. Record and capture all the details, don’t miss out anything. Full HD resolution with accurate color reproduction brings your recorded video to life. 1. Compatible with Lorex 1080p and 720p wired HD cameras only. 2. Recording time may vary based on recording resolution & quality, lighting conditions and movement in the scene. 3. HDMI output (1920×1080) HD for high definition multi-channel live viewing only. 1080p recording resolution is limited to a maximum of 1920×1080 per channel. Image quality and resolution is dependent on the type of camera connected to the DVR. 4. Requires a high speed internet connection and a router (not included). A minimum upload speed of 1Mbps is required for the best video performance. Up to 2 devices may connect to the system at the same time. 1. Compatible with Lorex MPX Series DVRs only. 2. Stated IR illumination range is based on ideal conditions in typical outdoor night time ambient lighting and in total darkness. Actual range and image clarity depends on installation location, viewing area and light reflection / absorption level of object. All trademarks belong to their respective owners. No claim is made to the exclusive right to use the trademarks listed. Your item will be shipped from manufacture warehouse within 1-4 business day(s).After shipping, items are usually delivered within 1-5 business days. items may be returned within 14 days from the date of receipt. There may be be 15% restocking fee.